I’ve purchased a 40 inch 4K (3840 x 2160) resolution monitor 3 months ago and have been using it frequently for both work and play. I did a quick unboxing and overview about 2 months ago promising an update. Finally, here are some of my thoughts on using a 40 inch 4K monitor as a computer display and the monitor itself in particular. 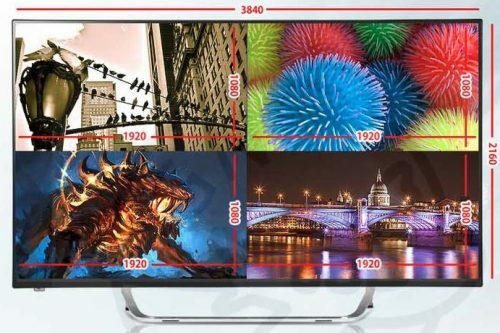 4 40 Inch 4K: What is it like? 5 Crossover 44K / 404K: Yay or Nay? Just a brief history on the displays I have used before finally “settling” (there is no such thing is settling in the world of computer setups) with the Crossover 44K. Before this, I had a Qnix 27” 1440P monitor and I absolutely loved it. I love the Korean monitors for the value they provide and the quality. I mentioned this before and I will always continue to do so: “Once you go 1440P, you will never want to go back”. I find that the extra screen estate a 1440P monitor provides to be so useful for all kinds of activities. Be it for work or even browsing the internet and whatnot. It is just much more enjoyable having a 27” 1440P display. For those of you who are still stuck on 1080P displays, do yourself a favour and save up to get a 27” ~ 32” 1440P display. If you are feeling brave, you can opt for a Korean one and it will not cost you much at all (you do not really have to be brave to get one. I mean there is the issue of warranty but hey I have used 3 different Korean monitors and none of them have failed me). Now a little more on what I usually do on my computer. There is the usual gaming portion of my computer time but the majority of which is taken up by simply browsing the internet, watching videos and basically the general casual stuff most people do on their computers. I do code a little bit (being a student in the field) but nothing too major or large scale yet. 40 Inch 4K: What is it like? When I say day to day general use I mean browsing the internet, watching some videos here and there, Facebook and everything you normally do casually. Now what is it like to have a gigantic screen to do all of such things? Hmm, pretty overwhelming at first but you get used to it. It is nice to have more than 3 activities (say 3 different websites opened) running but can you honestly use all of them effectively? I highly doubt so. Most of the time I find myself opening a video stream at one side and the other my main browser with the things I am currently reading or browsing. It is pretty much the same way I use my previous display and I do not find the extra screen estate to be any better. I mean it is nice to have but definitely not a must. Of course you can have your music library open at a corner, your twitter or social media app at another and still have two different browser tabs open and use them all at once. It is like using a dual monitor setup and while it is nice to be able to do such things, I do not find it a necessity for most people. If your computer can run the latest titles at 4K resolution smoothly, look no further. Gaming will never be the same again. Big screen gaming is much better and that is one of the reason why some people prefer gaming on their TVs using consoles or even hooking up their PCs to a “television-size” display. 40” is aplenty and even for the vast majority of you who cannot afford a PC powerful enough to game in 4K, turning down the resolution and other graphical settings and then playing on such a large display is still wonderful. I understand that some people prefer their 144Hz refresh rate monitors and I am by no means saying that this experience is better. What I will say though is that it will be a different experience and while we continue to wait for high refresh rates 4K IPS monitors, such comprises have to be made. It is a decision that you will have to decide on and I would say a larger screen and higher resolution is definitely my preferred solution. If you have any kind of 4K media content I guess the monitor will be a great choice for you. If you’re wondering why not get a 4K TV instead. Most TVs would not look as good as many 4K TVs at the moment do not do 4K 60Hz 4:4:4 chroma. There are ones out there (the latest Samsung models I think) that does support such a feature but is much larger and more expensive as well. This section is something that I am not particularly well-versed or experienced in. I mean I did do some small scale projects in terms of programming and I do see the usefulness especially being able to see more lines of codes and having the ability to refer from file to file without needing to tab here and there. That said, is it that much more efficient and effective than when I was using my 27” monitor? Not quite and that might be due to myself being ineffective in terms of using the extra screen estate. Think about it this way, a 40 inch monitor acts something like dual 24” monitors in portrait mode side by side without the bezel. Are you someone that effectively use such a setup? If so, I am pleased to say that a single 40 inch monitor might be perfect for you. For video and photo editors out there, the extra screen estate is definitely fantastic (all your effects at one side, full-screen previews for 1080P videos etc) but do think about the colour accuracy and reproduction of the monitor. I do not believe there are any “professional” grade monitors of similar size at this point of time. 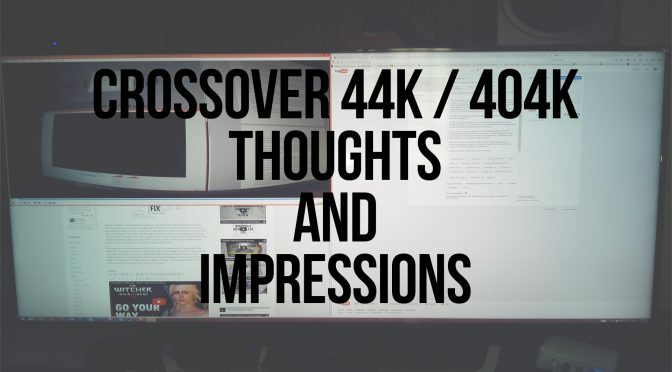 Crossover 44K / 404K: Yay or Nay? If you are here for a detailed and technical review, I am sorry to say but you will have to take a look at other reviews of the Philips bdm4065uc (similar panels confirmed by many). There aren’t any technical reviews of the 44K and I do not have the equipment to do any of that testing. Do stay on if you want to read about some of my “feelings” and “thoughts” about the monitor. I am and will always be a big fan of Korean monitors for their price and value. Ever since I purchased a 27” 1440P Korean monitor, I have been recommending them to family, friends, and fellow netizens. Where on earth can you find such a monitor that is similarly priced? I guess there is the second-hand market but that too has its risks similar to that of purchasing a product with no local support or warranty. For those that doubt the quality of the monitors, I myself have purchased a total of 6 Korean monitors for myself and others and none of them have spoilt. I do read of others that do not have similar luck but those are the minority. There are plenty others that are using their Korean monitors for years. The Crossover 44K is similar in terms of quality. When I unboxed it, fixed it and use it, the build quality feels good. Yes the stand is not the best and the panel might be what some people term as the A-minus panels. Take into account the price you pay and there is not much to complain. The Crossover 44K is apparently using the same panel as the Philips BDM4065UC but only at two-thirds of its price. Is that additional few hundred of dollars worth it for the local warranty and support? That I guess is something you will have to consider but for me personally, definitely not. How often do monitors die anyways? Never once did I face a situation where my monitor died before anything else in my setup. For me personally, coming from an IPS monitor, the image quality is fine. Colour reproduction is great and the sharper resolution is fantastic. I am talking from the point of view of a normal consumer and a gamer, not one of a professional photographer or videographer. Accuracy is never a priority for me and the monitor does well to please me. A lot of you will probably ask about input lag and response times of the monitor. Again I do not have any equipment to test it out for you but from the gaming that I’ve done, there is not a point of time that I feel the monitor to be sluggish or unresponsive. I do play all kinds of games (first-person shooters, RPGs, MOBAs etc) and they all do fine for me. That said, if you are some kind of competitive gamer which every millisecond means the world to you, you might want to get one of those “gaming grade” monitors. There is also the PIP (Picture-in-Picture) and PBP (Picture-by-Picture) functions that you may want to use. They all work perfectly fine and can be of some use to some of you. The advertised higher refresh rates and enabled overclocking of the panel is false. Don’t bother with that. The max you can go is 60Hz at all resolutions. Overall the Crossover 44K is a good buy if you are in the market for a 4K PC monitor. There is another 42” IPS 4K monitor out there that is really tempting but the price tag is slightly heftier as well. The Crossover 44K is a great value for money product that will fit both your budget and needs. Do you necessary need such a large monitor at such a high resolution? Not necessary for the majority of you. I will say that it is a nice product to have and to add to your setup but it is never a must. The extra screen estate is nice but not many will be able to use it effectively. Unlike going from 1080P to 1440P and from 24” to 27” ~ 32”, I will say that 4K and 40” can definitely wait. If you are still harping on whether you need a 27” 1440P display, you obviously do not know what you are missing out on. You can buy the Crossover 404K here at this amazon link. There is the option to purchase it through eBay as well but with Amazon’s customer service and support, I would rather go through them then eBay. Of course the sellers are third-parties but Amazon do cover such sales as well. I received my crossover 404 40 inch monitor about a week ago. What is the best way to hookup to my video card. I have a Nvidia 970 with hdmi and three DP ports. I tried the a hdmi cable 2.0 rated and hooked into the hdmi 2.0 port on the monitor and then to my video card. I selected the 2.0 setting on the osd screen on the monitor but had no picture. If I select hdmi -mhl port I have a nice picture at the high resolution but at 30 huz. I hooked the DP from my video card to DP on the monitor and selected this I got the 3840 x 2160 with 60 hz. What is the best way to hookup the monitor ? By right HDMI 2.0 should work. Not sure exactly why it doesn’t for you. I would recommend you to continue using DP.